61 Bowdoin Street, Boston, Wednesday, 9 November 1864: The great election-day passed off without disorder or disturbance – and, Thank God, Lincoln is re-elected by splendid majorities. Every New Eng. state, Penna. & New York state have gone for him. New Y. city went McClellan by 30,000 majority – but that was expected; & he has New Jersey & Kentucky – all the others are Lincoln. Kansas did not even have an opposition ticket, so heartily Republican was the whole state. The long anxiety, suspense, & dread are over – a good God has overruled the madness of home traitors for their own ruin, and the salvation of the country; that accursed Chicago platform, the offspring of foul treason, cowardice, and political corruption, happily trampled McClellan’s hopes to nothingness. He might have had some chance but for that. Thank God, that unprincipled party overreached themselves; the marvel is how right-minded men – men of judgment, and influential position, like my brother Wm. Gray, could so belie their own good sense and high character as to cast a vote for the nominee of that platform. And yet, to the regret of us all, he did so – and was so deluded by personal predilection for McClellan & personal dislike to the unpolished rail-splitter, Ab. Lincoln, that he could not see the abyss of ruin, into which he was aiding to plunge the country. God in his mercy has averted that danger – we have tided over the fateful hour, and can breathe once more, with hearts in which triumphant hope is second only to grateful aspiration to the giver of all good. The news to-night is that Sherman has burnt Atlanta, and moved on to besiege Charleston, S.C. God save them – it is a tremendous step to take through the heart of the enemy’s country. He is a great leader! We were rejoiced yest.y morning to hear of the arrival of the Kearsarge, Com. Winslow, in port, with several officers and men of the pirate Florida on board, prisoners. The Wachusett captured the Florida in the harbor of Bahia, cutting her out by a dashing maneuver from amidst the Brazilian fleet. This the commanding officer Capt. Collins felt justified in doing, since the Florida had destroyed many American vessels inside the prescribed 3 leagues from shore – and as there were 3 outlets from the harbor by which she could escape, there was no other way of putting a stop to her depredations, than by this bold stroke. A large part of the crew of Florida, with the Captain’s many officers, were on shore at the time of seizure, unfortunately. The Kearsarge, which a few months ago, sunk the Alabama, had the same ill-luck in respect of capturing rebels who escaped by British connivance, on the yacht Deerhound. But though the captains are at large of both these destructive pirates, the vessels at least will do us no more harm. But there are 2 new ones out, the Olustee and the Chickamaugua, doing incredible damage, beside the Tallahassee [sic]. Sunday, 13 November 1864: A dull November day with steady rain – the rain a great boon to the country, so we must not repine, though a week of dull weather is rather tedious. It has given me a chance to make some headway with my sewing. Isabella [Furfey] left us on Tuesday last – and I find myself very busy par consequent. There are so many interruptions in every housekeeper’s life, that a steady day’s work is a rare thing. Yesterday Mary [Gray] went with Laura Howe, to tend their table (Mrs. Howe’s) at the “Sailors’ Fair.” She was hardly well enough to go – but enjoyed it when there. Laura came back here to tea, bringing enveloppes for me to write the addresses on from a printed catalogue, for the “Sanitary.” So I gave my evening to that very willingly, instead of finishing off [her son] Sam’s drawers! I have not been to the “Sailor’s Fair,” though it is well worth going to; but I abhor going to Fairs, especially as I never spend freely at them – the fee is so high, a dollar for entrance, that I cannot even afford to let the children go. It is utterly impossible for us to do such things. It takes all we can do to live, merely, at the present cost of living!! The Democratic Party candidate, Major General George Brinton McClellan (1826–1885). Mrs. Gray had met him in Boston in February 1863, when she formed a more admiring impression of his character. Dr. Gray’s brother, William Gray (1810–1892), who married Sarah Frances “Sallie” Loring in 1834. Major General (later General of the Army) William Tecumseh Sherman (1820–1891). U.S.S. Kearsarge (1861), commanded by Commodore (later Rear Admiral) John Ancrum Winslow (1811–1873). Commander (later Rear Admiral) Napoleon Collins (1814–1875). The former C.S.S. Tallahassee (1864), renamed following the Battle of Olustee in February. One of the Grays’ housemaids. The households of Mrs. Gray’s stepmother’s aunt, and her mother-in-law and sister-in-law. Celina Holmes (1810–1900) married Lucien Skinner in 1833. Her daughter married Isaac Wainwright, the sister of Mrs. Gray’s best friend Rebecca, in 1867. One of Mary’s closest friends, Laura Elizabeth Howe (1850–1943), who married Henry Richards in 1871. Laura Howe Richards’s biography of her mother – written with her sister Maud Howe Elliott – won the Pulitzer Prize for Biography in 1917. 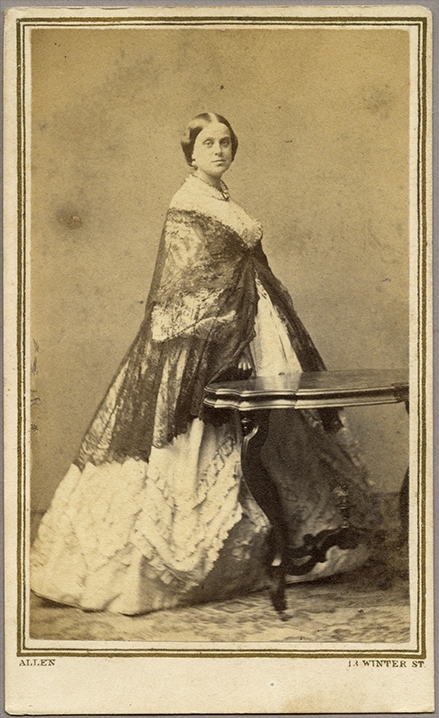 Julia Ward (1819–1910), who was married to Dr. Samuel Gridley Howe 1843–76; she is most famous for The Battle Hymn of the Republic (1862). Political corruption, etc. Guess the political scene has not changed all that much in 153 years……. Interesting as always but, particularly, I am struck how she thought Sherman was a great leader (burning Atlanta, etc. ).